Your Personal Invitation To The very best event of the year! A Once in a Lifetime Special Paranormal event! This most intense, in depth extraordinary gathering in the Most Haunted City In America! Hi there! I'm Patrick Burns of TruTV's "Haunting Evidence". I'd like to invite you to join me and my friends June 4th through the 6'th for a weekend in Gettysburg Pennsylvania - one of America’s most haunted towns! Ghostock Gettysburg promises to get you out of the conference room, away from the same old lectures and out into the town to enjoy the rich history that makes Gettysburng so facinating. Explore the battlefield and national park by day, and at night network and investigate with other paranormal enthusiasts. We’ve arranged for an exclusive nighttime investigation on a privately owned portion of the battle field, with a special historical presentation by Mark Nesbit of "Ghosts of Gettysburg"! Note that 20% of your registration fees go to the Gettysburg Battlefield Preservation Association! Admission is just $99 per person. Or $189 for two people. And for a limited time, register four or more people at the same time and its just $85 per person! HURRY - our special room rate is only good thru May 6'th! Click over to http://ghostock.com for event info and to purchase tickets. We're looking forward to a weekend in one of our nations most historically celebrated (and haunted?) towns, and I hope you'll join us! Tired of “paranormal conferences” where you sit in a lecture hall all day? So are we! So we’re rewriting the rules of what a paranormal conference is all about.Our goal is to get you out of the conference room and out to explore and learn about the amazing historical locations we’ll be holding events at. And as we have in years past, we’ll cap off the events with actual ghost hunts that you participate in! Star of TV's "Haunting Evidence"
Register now for GhoStock Gettysburg. Tickets are limited! 20% of registration fees will be donated to Gettysburg Battlefield Preservation Association! Special group rates for 4 people or more – just $85 per person! Note your registration fee includes the “meet and greet”, guided walking tour of Gettysburg and access to the after-hours investigation on battle field. Registration fees do NOT include hotel accomodations, travel, meals or other expenses. Your paid registration admits one person to all basic functions and events at GhoStock, June 4th – 6th 2010, during regularly scheduled hours for the day(s) it was purchased. Some designated activities may require pre-registration. ALL SALES ARE FINAL! Should the event be canceled we will issue you a full refund, however your purchase is non-refundable for any other reason. If you determine after your ticket purchase that you will not be able to attend the event, you may either transfer or sell your registration to another person at a price equal to or less than your original purchase price. OR you may defer your ticket purchase price for a credit to apply towards the registration for a future GhoStock event. I.E. if you paid $100 for your ticket, you will receive a $100 credit toward registration fees at a future GhoStock event of your choice. In registering for and in consideration of being admitted to GhoStock, the holder consents to being photographed and/or audio recorded (by film, tape, or digital methods) for exhibition in all media. Holder also hereby: (i) releases GhoStock, Patrick Burns (here-forth known as “organizer”), Ghost Hounds, other convention attendees, property owners of investigation locations, tour operators, the convention hotel, or any other persons or businesses associated either directly or indirectly with GhoStock from any liability for loss or damage to persons or property, infringement of any right, or any other claim or cause of action of any kind; (ii) authorizes and permits GhoStock organizer, Ghost Hounds, and all designees to use his/her name, voice, and/or likeness and all reproduction thereof in all media now or hereafter known for all purposes in perpetuity; and (iii) agrees to comply with all convention and hotel rules and regulations. GhoStock organizer or appointed staff representatives reserve the right to deny entry to or remove from convention facilities any person who, in the organizer’s or appointed representatives’ sole and absolute discretion is behaving or threatening to behave in a manner disruptive to the convention or other hotel guests. Your paid registration constitutes acceptance of the above outlined terms. Patrick Burns hosted the very first GhoStock in July of 2005 in historic Savannah Georgia. At the time, very few people were hosting paranormal conferences. GhoStock is one of the first and longest running paranormal conferences in the USA. Its 2010 – five years later, and Burns has an impressive track record of 7 GhoStock conferences behind him! The past events have featured notable guest speakers such as Steve Gonsalvez from the hit show “Ghost Hunters”, famed parapsychologists Dr. William Roll and the late Dr. Hans Holzer. The first 6 conferences were all held in Savannah Georgia, but starting with GhoStock 7, Patrick made the decision to take the show on the road. Starting with GhoStock 7 which was held in Salem MA, the conference is no longer a permanent fixture in Savannah, but is hosted at different locations all across the USA. GhoStock Gettysburg will take place in June of 2010, and GhoStock Key West in September of 2010. Other locations being considered to host the conference at include New Orleans, Saint Augustine Florida, Charleston South Carolina, New York City, Chicago, and even outside of the continental USA in Hawaii and Europe! Mark Nesbitt is a former National Park Service Ranger/Historian. He started his own research and writing company in 1977 and did research and advertising copy for some of America’s best historical artists. Beginning in 1978 he began writing books, including If the South Won Gettysburg (1980), 35 Days to Gettysburg (1992), Rebel Rivers (1993), Saber and Scapegoat: J.E.B. Stuart and the Gettysburg Controversy (1994), Through Blood and Fire (1996), and the best selling Ghosts of Gettysburg Series (1991- present). Many of his stories have been seen, and/or heard, on The History Channel, A&E, The Travel Channel, Unsolved Mysteries, Coast to Coast AM, and numerous other local television programs and specials. In July of 2004, his Ghosts of Gettysburg Series received the National Paranormal Award for “Best True Hauntings Collection” and “Best ‘Local Haunt’ Guidebook”. In 1994, Mark started the first ghost walk in Gettysburg, The Ghosts of Gettysburg Candlelight Walking Tours®. Armed with tales from his ghost books – and with a few that aren’t in the books -guides dressed in period attire take visitors on evening tours through sections of town that were bloody battlefields 13 decades ago; through night-darkened streets to houses and buildings where it’s not as quiet as it should be; to sites on the old Pennsylvania College campus where the slain once lay in rows, and the wounded suffered horribly, waiting to become corpses themselves; to cemeteries where the dead lie. . . sometimes not so peacefully. Gettysburg may very well be, acre for acre, the most haunted place in America. Patrick Burns is best known as the paranormal investigator star of TruTV’s (formerly CourtTV)Haunting Evidence. For three seasons, Burns was called to apply his vast knowledge of electronics and computer systems toward the goal of documenting paranormal activity. 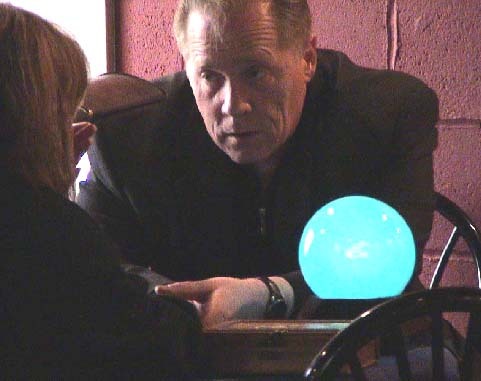 He is one of the most respected and in-demand paranormal researchers today, receiving requests to conduct investigations and lectures from coast to coast. Burns’ numerous technical skills include a mastery of advanced audio filtering techniques for enhancing faint EVP (Electronic Voice Phenomena) recordings. When not in front of a camera, Patrick can be seen working behind one. He is a professional photographer and videographer and was able to lend his vast knowledge of these fields to his role on “Haunting Evidence”. He is the founder and director of Ghost Hounds, one of the largest paranormal communities in the USA, and is the organizer and host of GhoStock: a paranormal enthusiast’s convention held annually at famously haunted locations across the country. Burns has always considered himself to be a “skeptical believer” and cautiously examines all claims of paranormal events. At a conference in the summer of 2008, Burns participated in several panel discussions alongside members of the James Randi Educational Foundation – one of the largest skeptical societies in the world. At the conclusion of the conference, he was singled out and lauded for being the only member of the paranormal community in attendance that willingly engaged and answered the tough questions posed by the skeptics. Patrick currently has several ambitious media projects in the works, including a “how-to” instructional video on ghost hunting and a series of DVD’s profiling allegedly haunted locations around the country. Somewhere in between, he’s managed to find the time to pen his first book: The Other Side: A Teenager’s Guide to Ghost Hunting with Marley Gibson andDave Schrader. After graduating high school in 1987, Burns enrolled in Columbia School of Broadcastings radio announcing curriculum. After completing the course of study, he worked in radio for a number of years. His formal training in reading copy to time has served him well thorough his paranormal career; when Court TV premiered the first pilots of “Haunting Evidence” in December of 2005, Patrick was called to do voice over narration for the two initial episodes. When not chasing specters through haunted houses and cemeteries, Patrick enjoys camping and SCUBA diving. Gibson’s publishing credits include “Ghost Huntress: The Awakening,” “Ghost Huntress: The Guidance,” and “Ghost Huntress: The Reason.” The next titles in the series “Ghost Huntress: The Counseling” and “Ghost Huntress: The Journey” will be released in September of 2010 and May 2011 respectively. She has also co-authored a teen ghost hunting how-to guide entitled “The Other Side: A Teen’s Guide to Ghost Hunting and the Paranormal” with Patrick Burns and Dave Schrader. Gibson is also the co-author of the wildly successful “Christmas Miracles,” written with Cecil Murphey, from St. Martin’s Press. The sequel, “Christmas Spirit” will be published in the Fall of 2011. Gibson has investigated haunts throughout the USA, including Rolling Hills Sanitarium, Waverly Hills Sanatorium, The Sprague Mansion, The Houghton Mansion, The Stanley Hotel, and the Queen Mary alongside well known paranormal celebrities like Jason Hawes, Grant Wilson, Patrick Burns, Chris Fleming, John Zaffis, Shannon Sylvia, Chip Coffey, Stacy Jones, Tiffany Johnson, and many others. Gibson holds a Bachelors of Arts in Communication with an emphasis in Advertising and a double minor in Political Science and Speech Communications from The University of Alabama. She has worked on several political campaigns, as a United States Congressional intern, and has been a marketing events manager in the medical, higher education, financial, and technology sectors. She travels extensively with her partner-in-crime, paranormal investigator Patrick Burns, and the two call Boston, Massachusetts home. She can be found online at www.marleygibson.com and www.ghosthuntress.com and via her group blog at www.booksboysbuzz.com. Join us for a weekend in one of America’s most haunted towns! Ghostock Gettysburg promises to get you out of the conference room, away from the same old lectures and out into the town to enjoy the rich history that makes Gettysburng so facinating. Explore the battlefield and national park by day, and at night network and investigate with other paranormal enthusiasts. We’ve arranged for an exclusive, private investigation on a privately owned portion of the battle field. pre-event hotel room rate available. Come mingle with the other early arrivals! Get out and see the town! Gettysburg awaits you! 6:00 p.m. – 9:30 p.m. – time on your own. We’re going to go explore Gettysburg Battlefield - Devil’s Den, Little Round Top and Pickett’s Charge, and invite anyone to tag along – free of charge! Psychic readings available by Melissa “Vegan Mel” Sehgal – contact her directly to schedule a time and for her rates.